Low launch prices offered to NASA by U.S. spaceflight firm SpaceX led a puzzled Chinese official to admit that China could not beat them. Now SpaceX chief Elon Musk has laid out the reasons for his company's competitive edge and called it a triumph for American innovation over cheaper overseas labor costs. "China has the fastest growing economy in the world," Musk said in a statement. "But the American free enterprise system, which allows anyone with a better mouse-trap to compete, is what will ensure that the United States remains the world’s greatest superpower of innovation." Any cost overruns would be covered by SpaceX and not U.S. taxpayers, Musk said. SpaceX has been profitable every year since 2007. "Moreover, SpaceX intends to make far more dramatic reductions in price in the long term when full launch vehicle reusability is achieved," Musk said. "We will not be satisfied with our progress until we have achieved this long sought goal of the space industry." 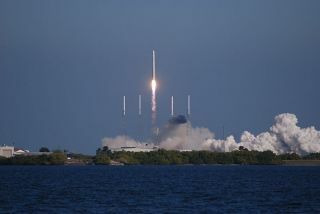 This story was provided by InnovationNewsDaily, a sistersite to SPACE.com. Follow InnovationNewsDaily on twitter @News_Innovation, or on Facebook.